The 2019 official Scottsdale Visitors Guide is out, and I’m happy to have four articles featured in this year’s issue. One of my summer assignments included the tough job of spending staycations at some of Scottsdale’s most luxurious resorts to find out which offer the most indulgent cabana perks. 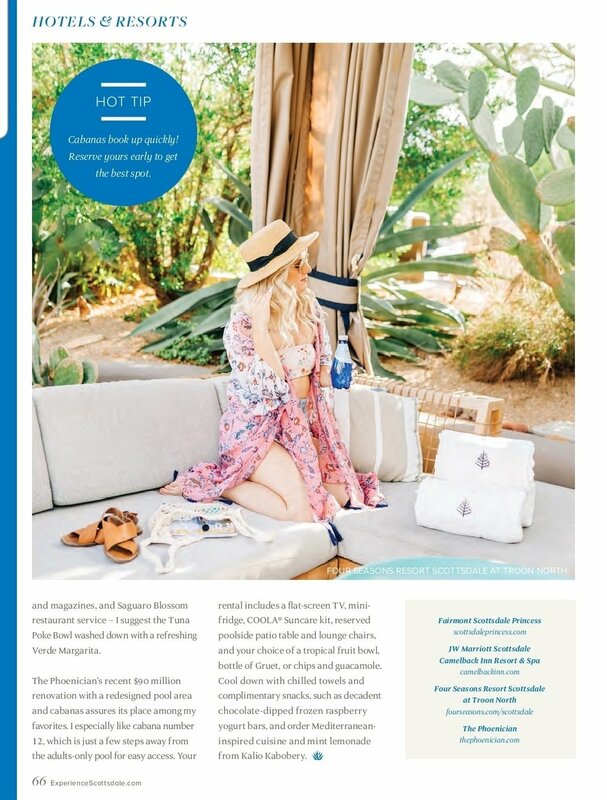 Here are four of my favorites and what you can expect when you pamper yourself with an afternoon spent in a posh poolside cabana: Center Island at The Phoenician Resort, Sunset Beach at the Fairmont Scottsdale Princess, Jackrabbit Pool at the JW Marriott Camelback Inn, and the Luxury Cabanas at The Four Seasons Resort Scottsdale at Troon North. Visit this link to download or order a copy of your free Scottsdale Visitors Guide.